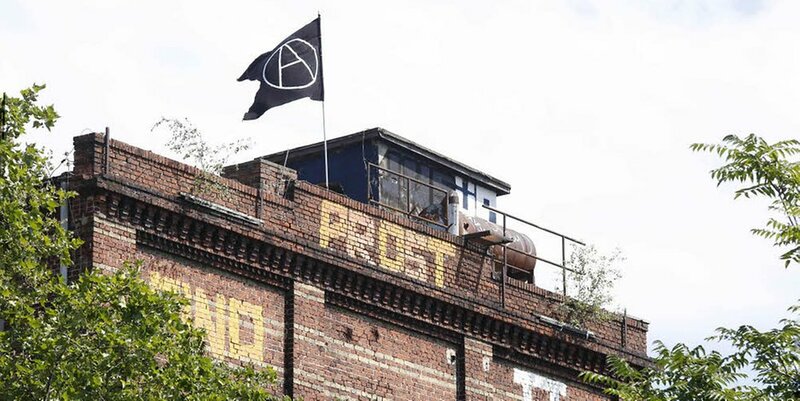 About 120 people came to a solidarity gathering to the squatted old Teppich Fabrik on Friday, after a court order which allows the owner to let the cops evict the building also known as “Die Platte” in Berlin’s Friedriechshain district. We knew it wouldn’t be easy to open new spaces, that we would have to put a lot of effort and energy into breathing some new life into this dusty old place. But we did it – in the hope to create a collective place, where a collective live and struggle against a system that constantly tries to opress us in all aspects, would be possible. We dared taking a step against political parties, the cops, secus and the city of the rich. We created a space for discussion, for living and fighting on our path and the path of so many others. This city is being restructured at a frenetic pace according to the rules of the money and capitalism – what’s left over is consumption and those that can still afford a life in this city. Those that dont fit in or dont want to be subdued will be marginalized more and more. All open spaces and empty houses are slowly turning into luxury development. Big corporations (like Siemens or Goole in Kreuzberg) are taking more and more space in the city. People that cannot afford the rising rents anymore get evicted. At the same time more and more fancy shops and restaurants are being built. The logic dominating our daily lives, work, consumption, obedience, paying rent, this isolated existance, give birth to a society where almost no human relations exist and no collective life or solidaric organisation is possible. We selforganize our lives, shaping a network of mutual aid and making space for collective resistance and struggle. For all this it is necessary to make our own spaces, where solidarity, autoorganization and direct action can be the base of our collective live. We think it is important to have a room for discussions and creating and athmosphere that makes it possible to fight. We will always be in conflict with the enemies of freedom, the cops, secus, politicians, the profiteers of capitalism and all those that stand behind them. As important as we deem it to open new spaces, as important it is to bring the struggle to the streets. For this we have to open ourselves to new strategies of resistance. From the old carpetfactory we cannot foget the struggle of Rigaer or Friedelstrasse, of Can vies in Barcelona, the Squatting Days actions in Amsterdam, Black Triangle in Leipzig and all the other projects up in struggle all around the world. Thank you for all the solidarity we received. With each and every act of mutual aid and solidarity we show them that we are not alone and that we will keep fighting with our heads up high! We will defend our spaces with all our means. Come bye, see you on the streets!